Through a special program organized by the Cyprus Shipping Chamber and the Cyprus University of Technology (CUT), Giorgos will be interning with us for the next 5 weeks. 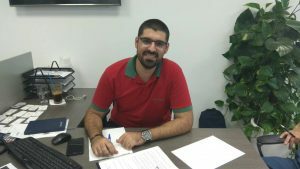 Giorgos is a graduate in Business and Management and is now currently studying for a Masters in Shipping and Management at CUT. Giorgos looks very excited on his first day. At BeFlexi we’re always looking for young, bright minds to join the team and, after the success we enjoyed from this internship program last year, we look forward to the surely positive impact Giorgos will bring.